Loyal customer Lionel Berthault writes about a series of once in a life time hunts. Enjoy! The Pyrenean chamois (what the French call “isard”) is a goat/antelope found in the Pyrenean Mountains along France’s border with Spain. Hunting them in the remote, high-mountain wilderness areas they inhabit offers one of the most demanding hunts in Europe. Last year, when I first began telling friends about an ambitious four-hunt tour of Europe I had planned, the biggest topic of discussion around the chamois was my level of physical preparedness followed by the type of gear I had chosen to take on the trip. The name KUIU kept coming up. Living on the remote African Island of Mauritius, I had never heard of the American company or their clothing. 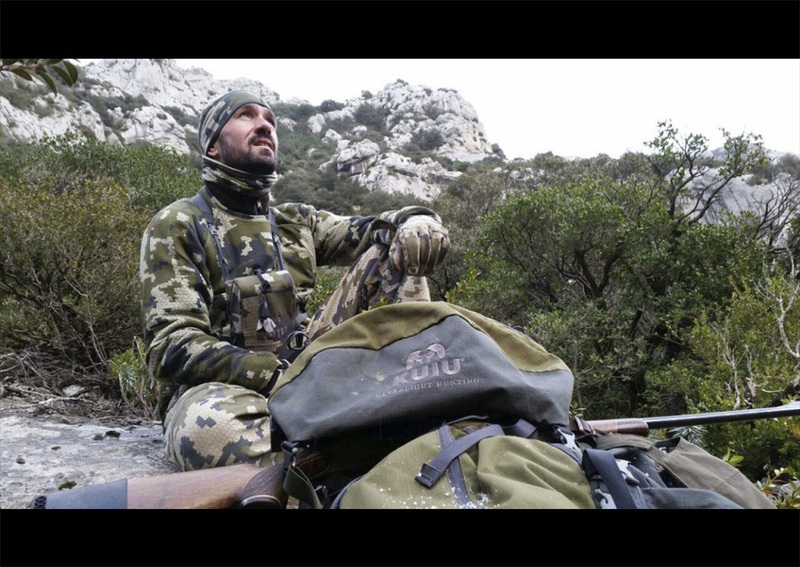 But then a chance meeting with KUIU European Sales and Marketing Manager, Jorge Amador, led to conversations about the various demands of my upcoming trips—particularly the hunt for free-range chamois. Funny to admit now, but I had always thought that technology in the outdoor clothing industry had advanced to a point where all of it was pretty much the same. Amador asked me if he could try to change my mind with a few KUIU items selected specifically for the terrain, unpredictable weather and demanding physical conditions I would experience. But not even I had expected the -10 degree weather and 80 km crosswinds I would encounter during the trip. My guide, Loïc, was a young but experienced professional hunter working for Acteon (www.acteon.com), a hunting association I have been affiliated with for well over a decade. Acteon commonly helps hunters in pursuit of such species as Roe Deer, Chamois, Mouflon, Red Deer in the most remote areas of the Pyrenees. Day 1 found Loïc and I high on a mountaintop in the blistering wind and cold searching for a heard of what he described as “nice males.” Snow was swirling in the incredible crosswinds, and it seemed inconceivable to me that anything would be out in such weather. But after two hours of climbing a huge male “isard” suddenly appeared high above us on a barren rock outcrop some 280 meters distant. In the fallen snow, the animal had not seen us. Or if he had, he felt safe from harm. A tremendous ravine stood between us, so there was no chance of stalking closer. Loïc considered the animal through the binoculars and excitedly told me this was one of the largest chamois he had ever seen. I had a good rest and confidence in my equipment, but at the shot we both looked on with great pity as the bullet struck just a few centimeters too low. Loïc would tell me later that, had I killed this particular animal, it would have been the biggest one of the 45 Pyrenean chamois his guests had taken with him that year. Day 2 dawned with more climbing and worsening weather. I hadn’t really noticed how my KUIU gear was performing—only that I was extremely dry and comfortable while Loïc was not. Not the sort of man to complain, Loïc did make mention of the gear and was clearly curious. During a one hour glassing session when the snow literally covered Loïc and me, he began asking where he could find some KUIU gear of his own. The discussion was cut short, however, when a strange and thunderous crashing drew our attention. Crashing down the mountainside came a boulder the size of a small house. It rolled and tumbled and there was no place for us to go. Thankfully, it steered 100 meters to our right, falling some 200 meters at an incredible speed, before crashing to a stop and exploding—a thousand pieces of rock flying in every direction—like a bomb. Late that afternoon, Loïc and I were considering heading back to camp, when we spotted an old female chamois running, dancing and jumping from rock to rock. It was as if she were playing in the snow. She was only the second chamois I had ever laid eyes on, but she looked beautiful—a fine trophy in my estimation—so I decided to try for her. Quartering away at some 180 meters, the doe was slightly above us. I took a prone position as Loïc reminded me to compensate for the wind. The wind never stopped blowing in two days on the mountain. I had to guess on the speed of the crosswind and how much it would cause the bullet to drift. Making a quick compensation, I fired and as if by magic the animal drop cleanly in its tracks. Looking back, the shot was more luck than skill. Snow completely covered us, and the wind was blowing so bad—causing the snow to swirl in great, white gusts—that I could hardly even see the animal in my Leica scope. Given the extreme conditions, taking the doe so cleanly was like a gift from the mountain, one Loïc and I were overjoyed to receive. A couple weeks later I flew to Budapest, Hungary, and then drove three hours east to reach the Slovakian hog hunting grounds owned by a friend, Miroslav (www.abcentrum.sk/en/). A long-time acquaintance as well as a good agent, Miroslav sends me some clients every year in Mauritius. He is also well known in European hunting circles where you’ll only hear good opinions about his organization. This particular hunt was going to be very unique for two reasons: 1) it was a management hunt and 2) we would be using night vision equipment; a first for me when hunting wild boar. 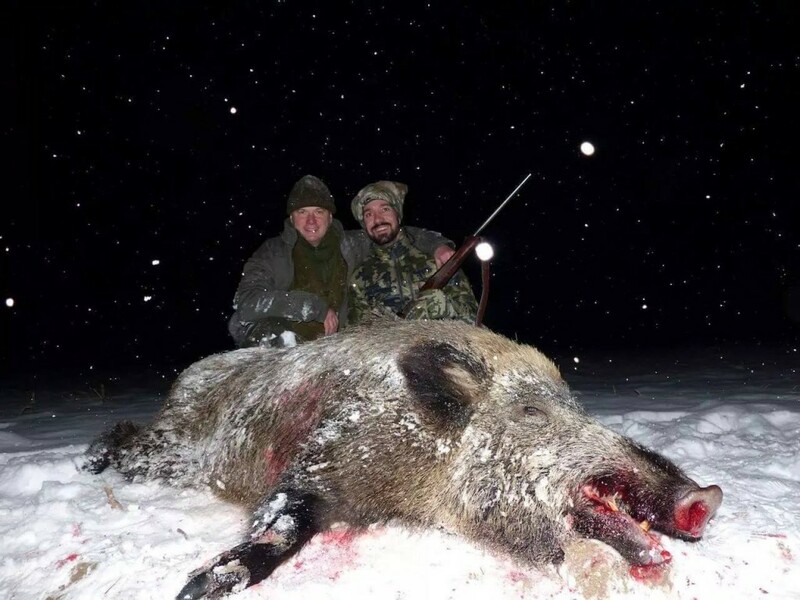 Being responsible for herd management, Miroslav believed night-vision technology provided the cleanest and most effect method to cull the largest boars from the population. 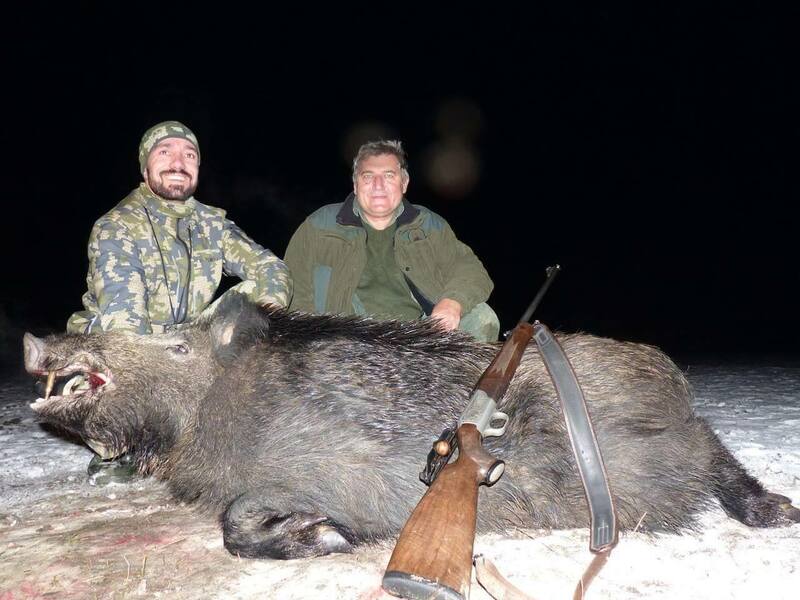 We would only be targeting the largest boars and, if successful, Miroslav promised a glass of pàlinka, a traditional alcoholic drink, to celebrate. That night as we headed out, clouds hid the moon overhead and a crusty layer of snow covered the ground. It made for noisy walking—so loud I could not imagine that any animal would let us get close. But the view through the night-vision binoculars showed otherwise. It seemed as if everywhere we looked there were little white spots—animals of every size and sort—and only after about 20 minutes we came to a clearing in the forest where a group of at least 20 wild boars were rooting in the snow for food. The range was 130 meters, and Miroslav immediately pointed out a big male. I took a rest and readied my rifle, a nice R93 Blaser equipped with a 3x night vision scope. The big boar stood broadside as I took a rest and fired. At the shot, the herd scattered, the boar going one way and the rest of the herd going the other some 300 meters before disappearing into the forest. Miroslav was convinced that I had missed. But we only traveled a short distance along the boar’s trail before finding him quite dead. Miroslav guessed the animal’s age at three years and its weight around 200 kilos. Some great genetics here, I thought. The next night I shot a smaller boar after a short stalk. But the first night’s hunt will always remain the highlight of my trip to Slovakia. 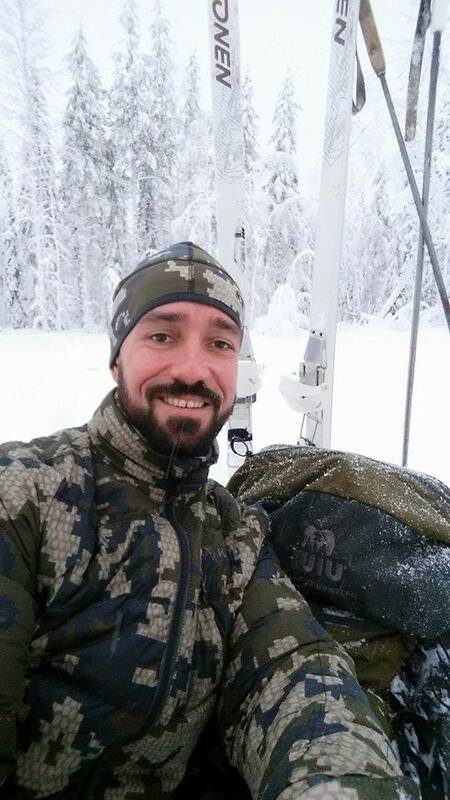 I had always heard that hunting in the magical country of Sweden is a fantastic experience, and after spending some days with Camp Lapponia, I can say that it is more than magic: It is pure, white, unique, fantastic, intense and very, very cold. Some years ago, I met Emil Nicklasson (camp-lapponia@passagen.se) and promised to do this trip with him and his company. When considering what and where to hunt, I have always been drawn to challenging species that inhabit remote and inhospitable terrain. When planning such a trip, choosing the guide is also of the utmost importance. The guide or outfitter’s passion—his way of speaking, his way of listening, his way of being—has always weighed heavily into my decision. For me, Emile is the perfect professional hunter: a local with strong ties to the area he hunts; a strong man and musician who can play accordion; a kind man who listens to his clients and always does his best to make you feel comfortable. Lapland’s Vhilemina airport is so small that it looks more as a bus station than an airport. When I arrived, the temperature measured -18. Everything was snow covered: white, white as far as the eye could see and nothing moving anywhere over the barren landscape. The picture reminded me of my first trip to Alaska. 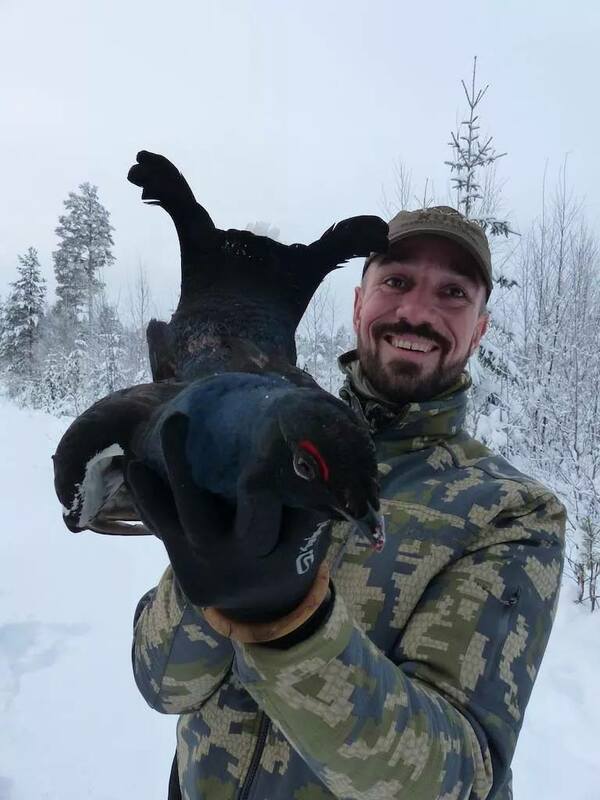 But that was 20 years ago and the animal I was looking to check off by bucket list was not a grizzly, a big giant moose or a black bear but rather the biggest of the small game: the European Black Grouse and the Giant European Capercaillie. An interesting wrinkle to the plan came when Emile explained that we would be using skis on the hunt. I had never skied before in my life), and to do it in such blistering cold and with a rifle—a 6.5 Swedish, of course—the plan seemed challenging to say the least. But at least with my KUIU outfit I felt confident that, if nothing else, I would not be cold. The skis did prove an awful challenge for me when the actual hunting began. After three hours traveling over soft snow, I felt like I was doing more falling than skiing. I began to question what I was doing and why I had signed on to hunt one of these black, evil grouse. But after another hour of drudgery cutting a snowy path through the forest, a group of black grouse suddenly lifted up in front of us. They streaked away toward a mountain looming up many kilometers ahead, and for a moment I was deflated, thinking we had spoiled out only chance. Emil, however, looked thrilled. Barely able to stand on the skis, I was confused. The birds were headed up the mountain. Did he expect me to climb a mountain skis? And succeed we did. After climbing, falling, skiing, climbing and falling again and again we found the birds sitting in the top of a tree at some 150 meters. Only the male can be legally taken, and we quickly spotted one there in the top of its perch. Laying the rifle across my KUIU pack in the snow, I chambered a round in the rifle, took an aim and slowly squeezed the trigger. At the shot, the bird crumbled and fell. I was so happy. The bird proved magnificent, both in the hand and later on the table. But there was little time to celebrate as Emile reminded me that we had one more trophy to find. The capercaille were likely close, he said—just a few more miles. I nearly balked at the thought. The snow seemed to be getting deeper the higher up the mountain we traveled. But Emile was confident and urged me on, one kilometer at a time. His prediction paid off when, four hours and three kilometers later, we came upon a large capercaillie also roosted it a tree. The second shot was a repeat of the first. Two of the most rare and elusive birds in Sweden! The feeling of joy I had was palpable. March found me traveling, at last, to Croatia where I planned to hunt one of the most difficult and dangerous animals in Eastern Europe. Only 125 brown bear tags are offered to noncitizens each year in the country, and I managed to secure one through a longtime friend and guide, Grgur (www.lovag.hr), I met at the airport in Zagreb after a two-hour flight from Paris. 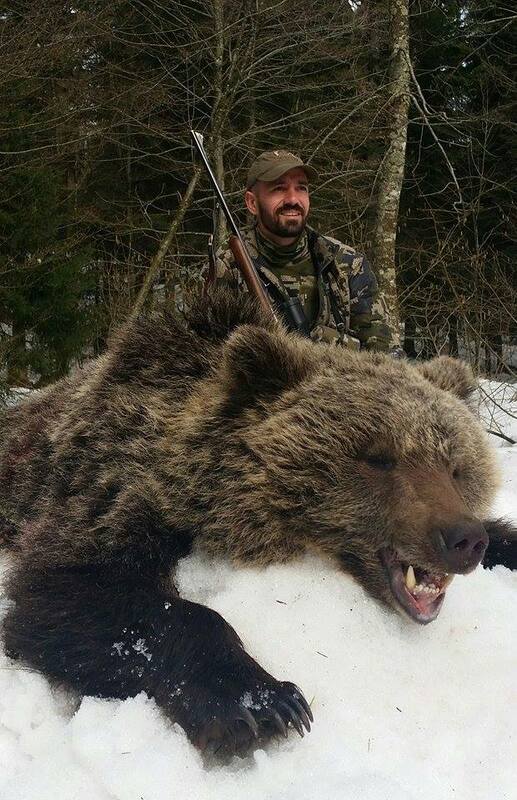 Typically, baiting is the only option for hunting brown bears in Croatia. Like hunting black bear in much of Canada or when hunting leopard in Zimbabwé or Tanzania, baiting is often the only viable method for hunting brown bears in the forests of Croatia. But I enjoy a hunt when it is tough. So after talking with Grgur, we decided to do it by spot and stalk. 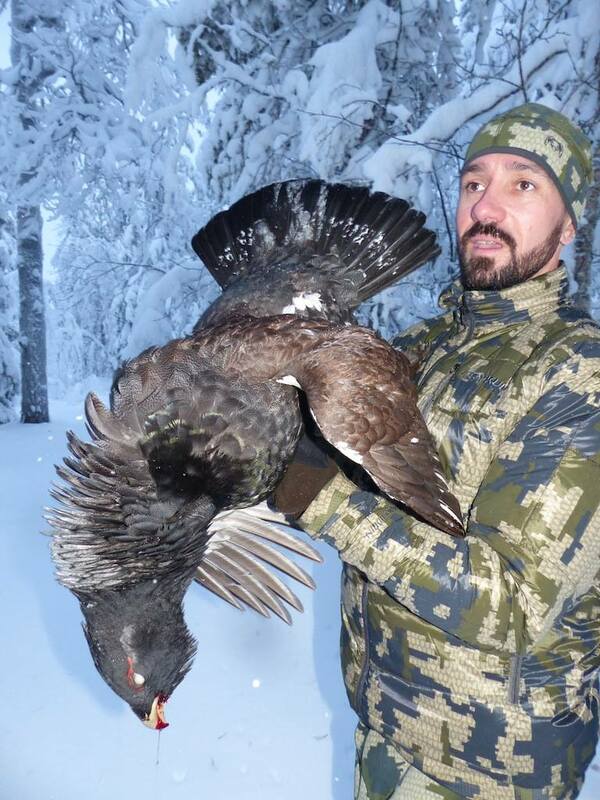 The fact that I was hoping to get the entire hunt on video made the prospect of success even more difficult, but Grgur felt confident we could pull it off if I was up for the challenge. Day 1 we saw little in the way of actual bears but plenty of sign that proved the bear population was very high in the 11,000 hectares of open forests we had access to. Traveling some 12 kilometers on foot that day, we spotted red deer, roe bucks, chamois and a set of huge wild boar tracks that likely came from a male weighing 150 kilos. Day 2 was more of the same—more walking and seeing plenty of bear sign but no bears—while the other hunters in camp were reporting seeing bears almost every hour while comfortably waiting in their blinds. 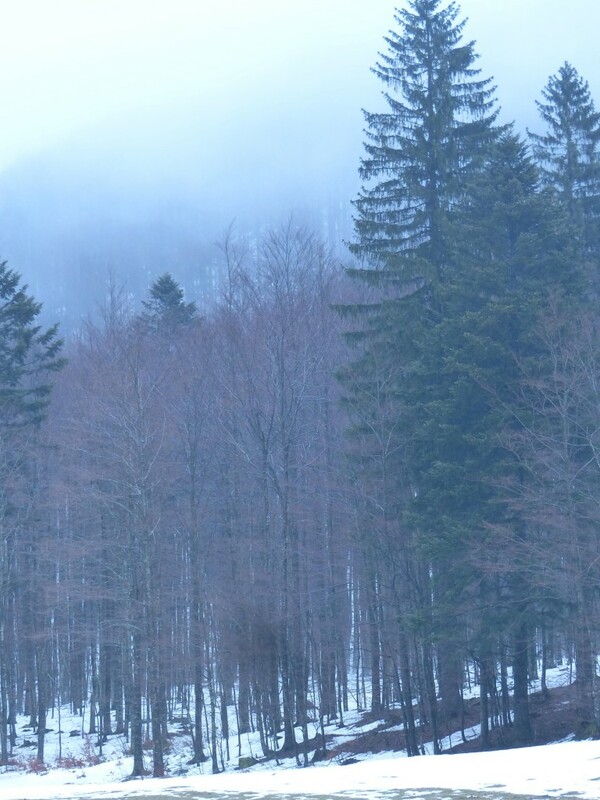 One hunter from Germany saw six bears in six hours while on stand. But I stubbornly refused to give in. My hunt was scheduled for only five days, and we guessed that during the first four days we logged over 45 miles hiking and glassing with nothing to show for it. By the last day, every other hunter in camp had taken a bear. The biggest one was aged at 18 years—a real monster—that weighed well over 300 kilos. Despite the success of everyone around me, I decided not to waiver from my plan. I had one day left and was prepared to go home empty-handed. It would not be the first time. Every day brings new opportunity. So I began the last day hopeful for a change in luck, and I was almost immediately rewarded when we found a nice set of fresh tracks in the snow. We set off after the bear, moving as silently and as quickly as the conditions would allow. 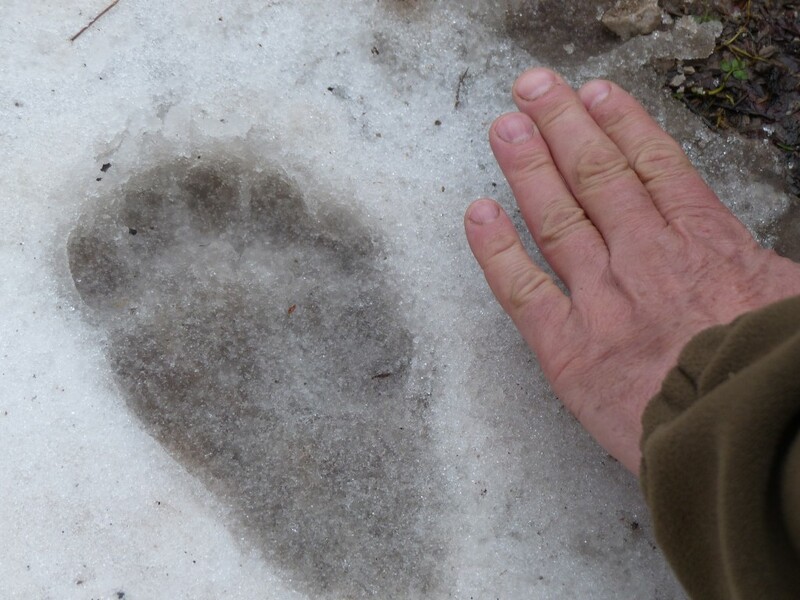 For nearly two hours we followed the tracks until, like magic, the bear appeared. The beast was magnificent. The fur on his shoulder danced in the slight cross breeze. At less than 100 meters, I could have easily took a shot from where we stood but decided to move closer for the sake of getting the encounter on video. The bear never moved while I quickly situated the camera and readied the rifle. My guide had had just about enough and was begging me to shoot, but just as I readied to squeeze the trigger the bear began walking away. I adjusted the camera to get the animal in the frame. But again, as I readied to shoot he moved. This process repeated itself at least one more time. Silently, I vowed to bring a cameraman with me the next time and, at the risk of missing my opportunity, I decided to simply place the camera’s view finder well ahead of the animal, hit record, and hoped for the best. Amazingly, it worked. 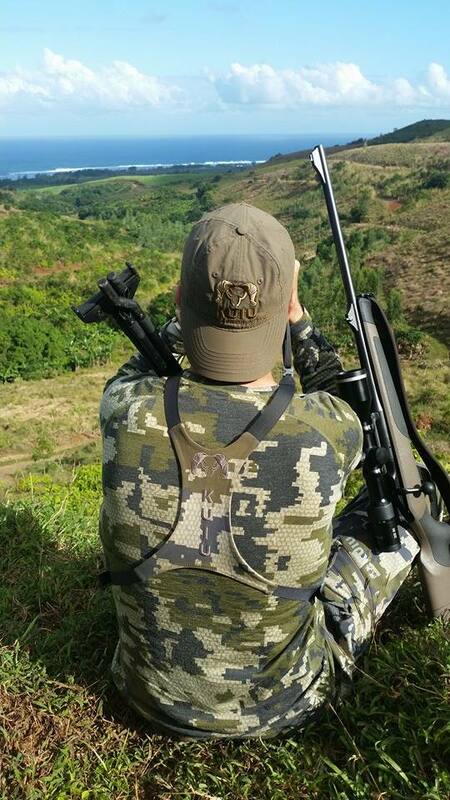 The 30-06 boomed and the bear rolled, biting at his side. I reloaded and shot again. The second bullet struck, too, but it was probably unnecessary. The bear was down, and the feeling at that moment was pure elation. After a week of hard hunting, I had my bear—not the biggest one ever shot in Croatia but likely the only one killed by spot-and-stalk in the last 25 years, according to my guide. Congratulations on an extrodinary hunt of a lifetime. Thank you for sharing.